← Have you created your ‘Customer Corridor’? 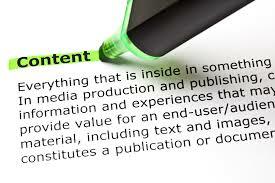 “Content is King” – This statement about content has been used for a few years now. It draws our attention to the importance of content and makes some of us wonder whether we are using content effectively. Most business people that I talk to tend to make the same, or very similar, statements to me when we discuss their marketing, ideas for their content and their social media strategy. These first three comments are very typical. It is because many of us do not enjoy being in the limelight. Content and Social Media – what do we do? The first of these issues – writing content, can be easily solved by employing a writer/journalist, who should want to get to know you and more importantly, your customers. In particular, before they put pen to paper, they need to understand what your customer issues are and why these customers might buy from you. This may also solve your problem of time, or lack of it. Certainly after the initial consultation period when the writer is doing their research on your business. The need for social media activity can be dealt with similarly as it is something that can be outsourced. The issue however, is not just getting the jobs done, but more critically, ensuring that what is being done actually fits into a framework that actually helps you generate more business. In effect, It needs to fit into your marketing or communications strategy and the whole lot needs to be interconnected. It then will provide your customer with an easy route to YOU. One of my clients said to me: “I would like our prospective customers to know more about us before I get to see them – that would be really valuable”. This was a much more focused approach from my client. He knew where he wanted to be and it showed that he had already begun to look at his customer’s ‘route to the sale’ or his ‘customer corridor’ as I describe it in my marketing strategy workshops. He was not just looking at writing some content, but his mind was focused on what he could actually achieve with it. How it could affect his customer’s behaviour. The purpose of some of your content is to ‘inform’ your prospect as he makes his way towards your door, so to speak. By the time he gets all the way along the ‘corridor’ he should know a lot more about you. The essence of successful communication is simple:- Don’t tell them what you can do, tell them what you can do for them! Make sure your reader understands that HE is the most important person in the article that you write – not you! The message in the article must hit him straight between the eyes, and then he needs to know that you understand how to help him. If this is done correctly and the content is placed where your target audience will see it then you have the basis of a content strategy. Then you need a few calls to action and some ‘teaser content’ in place. Link this together with your website, any 3rd party websites or digital magazines and then add the power of social media and you will start to attract new customers. This entry was posted in Article Writing, Marketing, Social Media Marketing and tagged content marketing, copywriting expertise, copywriting ideas, copywriting tactics, David Lomas, David Lomas M3 Media Publishing, m3 media publishing, social media marketing. Bookmark the permalink.